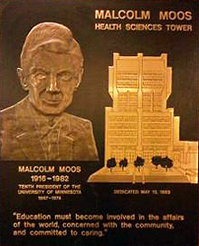 In honor of Presidents Day this week, it seems appropriate to look at one of our own university presidents and the history behind the naming of the Malcolm Moos Health Sciences Tower. Dedicated in 1971 as Unit A Health Sciences Tower, the building was the first in the planned complex of health science facilities that would create functional administrative and laboratory space twenty-two-stories high above the Twin Cities campus. In February 1980, the Board of Regents discussed the need to appropriately honor President Emeritus Moos by naming a building on campus after him. 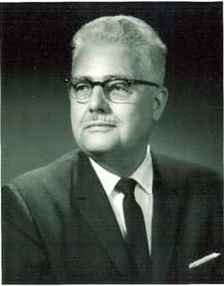 Malcolm Moos, the tenth president of the University of Minnesota and the first graduate of the university to hold the position, served as president from 1967 to 1974. The Regents suggested Unit A as a way to recognize the administrative reorganization and physical expansion of the health sciences during his tenure. Then president C. Peter Magrath followed by requesting Dr. Lyle French, Vice President for Health Sciences, to formally nominate the name change to the Honors Committee. After the building’s original dedication, opinion regarding potential naming opportunities proliferated. Suggestions of people to honor included Dr. Gaylord Anderson, Dr. Elexius Bell, Dr. William Crawford, Dr. Charles Hewitt, Dr. Henry Michelson, Dr. Maurice Visscher, and Dr. Cecil J. Watson. Even after the Regents suggested Moos as an appropriate name, some thought it did not follow the established guidelines for naming a building after a president. Specifically, the building did not serve a general university purpose. In January 1982, Malcolm Moos passed away at the age of 65. That April, the Regents unanimously approved a resolution to rename the building and on May 13, 1983 of the following year a name changing ceremony took place. In 2005, the Regents renamed a second health sciences building to honor the thirteenth University of Minnesota president. The Basic Sciences and Biomedical Engineering Building (BSBE) became Nils Hasselmo Hall.